Cut the pumpkin into strips and fry in a pan with a little oil. Chop the tofu and add to another pan with plenty of sunflower oil. Dab pumpkin and tofu well with a paper towel to remove excess oil. Cut the red cabbage into thin strips. Halve the cucumber, remove the inside seeds, and cut into thin strips. Remove leaves from the mint sprig. Cook the glass noodles according to the package instructions and drain well. Fill a wide container with boiling water and immerse one rice paper completely. Attention: Do not fold or kink! Spread the wet rice paper flat on a cutting board. 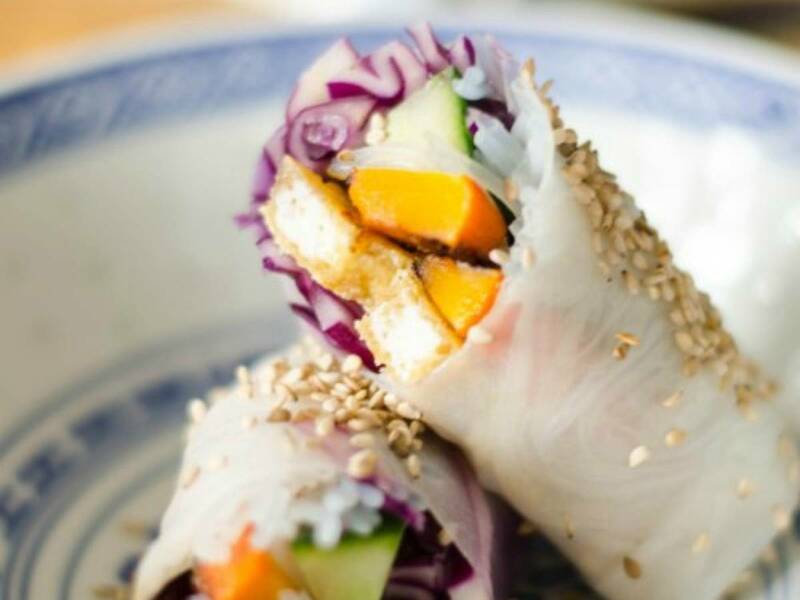 Arrange the ingredients horizontally in the middle, leaving 2 cm of rice paper at the left and right ends. Fold the left and right ends in, then roll up everything from bottom to top. Do not panic, the first attempts may not work so well, but soon you'll get the hang of it! For the soy dip, put the garlic and sugar in a pan and caramelize. Deglaze with oil, most of the soy sauce, and the hoisin sauce. The peanut dip is done very quickly: Just mix the remaining soy sauce, tahini, peanut butter, and water together.